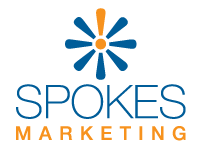 Spokes Marketing customizes our approach to Social Media Marketing specifically for each client. Business-to-Business companies succeed with a more business-oriented approach, often incorporating LinkedIn. Business-to-Consumer clients may need a more complete approach including Facebook, Twitter, Pinterest, Instagram, Flickr and Foursquare. There are many best practices these days designed to maximize opportunities to engage an audience and motivate them to respond to your call to action. First step – Generate an audience. You have a megaphone but you need an audience. Without an audience, nobody can hear you. Second step – Create effective campaigns. These campaigns are your ‘call to action.’ What do you want your audience to do? Buy something? Help spread the word? Submit videos? Spokes Marketing partners with our clients to create effective and engaging communications designed to motivate the masses. Third step – Analyze. It is important to look at metrics to determine whether your campaign has had any effect. Did it generate a larger audience? Did it boost sales? What was your ROI? What was your opportunity cost? Healthy metrics make for healthier campaigns. When we work with you, we will generally help you develop an overall strategy that can include building out your page and updating your site on a regular basis. We can do research, write articles and blog posts and more. Are you looking for more information on Social Media Marketing?